The first U.S. secretary of the treasury, Alexander Hamilton was one of the leaders of the nation's first political party, the Federalists (a group who supported a strong central government). Hamilton remains a well-known figure in U.S. history. He is known not only for the great contributions that he made to the early United States but also for his famous duel with Aaron Burr (1756–1836) in 1804, which resulted in his death. Alexander Hamilton's birth date is disputed, but it is often listed as January 11, 1755. He was born on the island of Nevis, in the British West Indies, the illegitimate son (his parents were not married to each other) of James Hamilton, a Scotsman, and Rachel Fawcett Lavien, the daughter of a French physician. Hamilton's education was brief. He began working between the ages of eleven and thirteen for a trading company in St. Croix, an island in the U.S. Virgin Islands. In 1772 he left to attend school in the American colonies. After a few months at an academy in New Jersey, he enrolled in King's College in New York City. Intelligent enough to master most subjects without formal instruction and eager to win success and fame early in life, he left college in 1776 without graduating. The outbreak of the American Revolution (1775–83), when the thirteen British colonies in North America fought for their freedom, offered Hamilton the opportunity he craved. In 1777 he became a lieutenant colonel (an army officer who is above a colonel) in the Continental Army (the national army fighting for American independence) and assistant to commanding general George Washington (1732–1799). Hamilton became one of Washington's most trusted advisers. Although he played no role in major military decisions, Hamilton's position was one of great responsibility. He drafted many of Washington's important letters, he was sent on important military missions, and he wrote several reports on the reorganization and reform of the army. In December 1780 he married Elizabeth, the daughter of Philip Schuyler (1733–1804), a member of one of New York's most distinguished families. Hamilton eventually returned to New York. In 1782 he became a lawyer following a short period of apprenticeship (studying and learning a job from someone already in that position). Hamilton's ideas on government and society had changed during the Revolution. Having been born in a foreign country gave him a different viewpoint from most people. Working for Washington had allowed him to observe how the weakness of Congress and how state and local jealousies were hurting the war effort. From this point on Hamilton believed in, and tried to work to bring about, a strong central government. Attending the Continental Congress as a representative from New York from November 1782 through July 1783, Hamilton tried to make sure that the new government would have the powers it needed to deal with the problems it faced after it won independence from Britain. As one of the twelve delegates to the Annapolis Convention of 1786, he drafted its resolution (final decision or opinion) calling for a constitutional convention to make sure that interests of the union as a whole were placed over individual state and local concerns. to ratify, or approve, the Constitution. Although others wrote for The Federalist, Hamilton wrote fifty-one of the eighty-five essays. They contain some of America's most original and important writing on politics and help explain some of the wording of the Constitution. At the New York convention in 1788, as a result of Hamilton's efforts, the Constitution was ratified. In September 1789, some six months after the new government was established, Hamilton was named the nation's first secretary of the treasury. This was the most important of the executive departments because the new government's most urgent problem was to find ways to pay the national debt—domestic and foreign—that had grown during the Revolution. Hamilton wrote many reports on the American economy, and many of his suggestions became law. Hamilton's ideas were not exactly original (they were similar to British policies), but they were sensible and took into account the needs of the new country. Hamilton's importance during this period was not confined to his work as treasury secretary. As the "prime minister" of Washington's administration, he was consulted on a wide range of problems, foreign and domestic. In addition, he is considered the leader of the country's first political party. Hamilton himself disliked the idea of political parties. 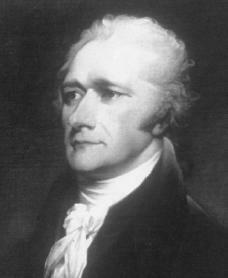 However, when the debate over his policies revealed disagreement among the members of Congress, Hamilton assumed leadership of the pro-administration group, known as the Federalists. Hamilton retired from office in January 1795. He returned to his law practice to make money to support his growing family and soon became the most distinguished lawyer in New York City. His interest in public affairs continued, however, and he served as President Washington's adviser. He helped Washington write his famous "Farewell Address" (1796), in which Washington turned down a third term as president. Hamilton remained active in politics as well, speaking out in favor of candidates he liked and criticizing those he opposed. While many held Hamilton in high regard, others neither liked nor trusted him. During the presidency of John Adams (1735–1826), however, Hamilton continued to have considerable national influence; members of Adams's cabinet often sought and followed his advice. In 1798 they cooperated with George Washington to secure Hamilton's appointment—over Adams's strong opposition—as inspector general and second in command of the U.S. Army, which was preparing for a possible war against France. Since Washington chose not to assume active command, organizing and recruiting these troops fell to Hamilton. His military career came to an abrupt end in 1800 after President Adams sent a peace mission to France that achieved a settlement of the major issues. Although his interest in national policies and politics was still strong, Hamilton's role in national affairs after 1801 became smaller. He continued to publish his opinions on public affairs in the New York Evening Post. In 1804 he took a stand against a rumored plot by New England and New York Federalists to break up the Union by forming a northern confederacy (a separate union). Hamilton believed that Vice President Aaron Burr (1756–1836), whom he referred to as "the most unfit and dangerous man of the community," was involved with this plan. Hamilton also actively stood against Burr's bid for the New York governorship. After Burr lost the race, he angrily challenged Hamilton to a duel. Hamilton believed that his "ability to be in [the] future useful" demanded that he meet the challenge. After putting his personal affairs in order, Alexander Hamilton met Burr at dawn on July 11, 1804, on the New Jersey side of the Hudson River. The two men exchanged gunshots, and Hamilton fell, mortally wounded. Many believe that he missed Burr on purpose, leaving himself an open target for Burr's bullet. Hamilton was carried back to New York City, where he died the next afternoon. Brookhiser, Richard. Alexander Hamilton, American. New York: Free Press, 1999. Flexer, James Thomas. The Young Hamilton: A Biography. Boston: Little, Brown, 1978. Reprint, New York: Fordham University Press, 1997. Knott, Stephen F. Alexander Hamilton and the Persistence of Myth. Lawrence: University Press of Kansas, 2002. McDonald, Forrest. Alexander Hamilton: A Biography. New York: Norton, 1979.